Colortrac SmartLF SC36 Xpress captures detailed technical images and graphics in colors up to 96.5 cm (38 inches). Its fast, intuitive, and space-saving design makes it ideal for a busy environment. The SC Xpress offer scans of technical documents and large format graphics for sizes up to A0 (up to 91.4 cm wide by virtually unlimited length). It is the ideal scanner for capturing all kinds of architecture, engineering, construction, property management or EDC (Electronic Document Capture) documents. And as a novelty, now the SC Xpress Colortrac scanners include the premium software of scanning SmartWorks PRO SCAN, and pedestal with wheels and basket (does not include monitor or its support, sold as an accessory separately). Premium copying software SmartWorks PRO COPY available. The Colortrac SC Xpress 36 is another model of the wide range of Scanners SC Colortrac Xpress using digital scanning technology SingleSensor. This patented innovation by Colortrac invention combines image contact sensors (CIS) in a robust and unique piece, which enables significantly higher optical quality and dramatically increases the stability of the alignment of the resulting pixels. The 36 "(91.4 cm) wide scanner has 43,200 short-capture sensors and LED lighting in a bi-directional arrangement specifically designed for this model.The combined work of LEDs and CIS sensors reduces optical errors to a minimum, ensuring that all the images scanned to a file or for copy reach the maximum dimensional precision and the highest chromatic range.The shadow effect on folded or wrinkled documents are also reduced by the active pressure system that presses gently and uniformly the document against the SingleSensor glass The Colortrac SmartLF SC Xpress 36 uses low energy "instant-on" lighting technology and is Energy Star certified. The scanner is manufactured to meet or exceed all current electrical safety standards. The provision of the feeding system of the Colortrac SC Xpress 36 SingleSensor ensures that the document will always be in contact with the optics. The trailing rollers on both sides of the scanner's optical area exert a gentle active pressure throughout the entire SingleSensor allowing the scanner to respond dynamically and actively against the unbalance usually caused by the folds and wrinkles of the paper. This technology ensures that delicate or fragile material such as newspapers or test paper can be scanned accurately and safely. 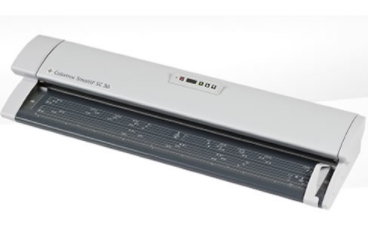 The Colortrac SmartLF SC Xpress range of large format scanners were the first scanners to incorporate the new SuperSpeed ​​USB 3.0 digital interface. With a radical increase in data transfer x10, the new USB 3.0 interface works at speeds of up to 5Gb / s. In terms of scanning speed and transfer to the computer, this represents more than twice the previous speed of 28MB / s (USB2) to 65-85 MB / s (USB3) depending on computer parameters. At the time of the launch of the SmartLF SC range, SuperSpeed ​​USB 3.0 is exclusive to Colortrac and allows working at maximum speed with the highest resolutions ever used, in larger documents. For those computers without USB3 connection, the Colortrac SC Xpress 36 enables the USB2 interface achieving a 25% increase in transfer speed (35MB / s) beyond the maximum achieved so far in the sector, 28MB / s, for a standard equipment Equipped with USB2 connection. A higher data transfer speed gives the user of the Colortrac SmartLF SC Xpress 36 the freedom to scan larger documents at higher resolutions without affecting their productivity. NOTE:Drivers and firmware must be maintained at the latest release for maximum product functionality and reliability.